Climate change can have mixed consequences: It would appear that the warming of the Mediterranean region, which has brought greater heat and drought to the countries there for around 20 years, is behind an increase in rainfall in the Sahel region. As researchers from the Max Planck Institute for Meteorology in Hamburg report in the current edition of the journal Nature Climate Change, due to higher sea temperatures in the Mediterranean more moisture from the eastern Mediterranean is reaching the southern edge of the Sahara at the start of the West African monsoon in June. 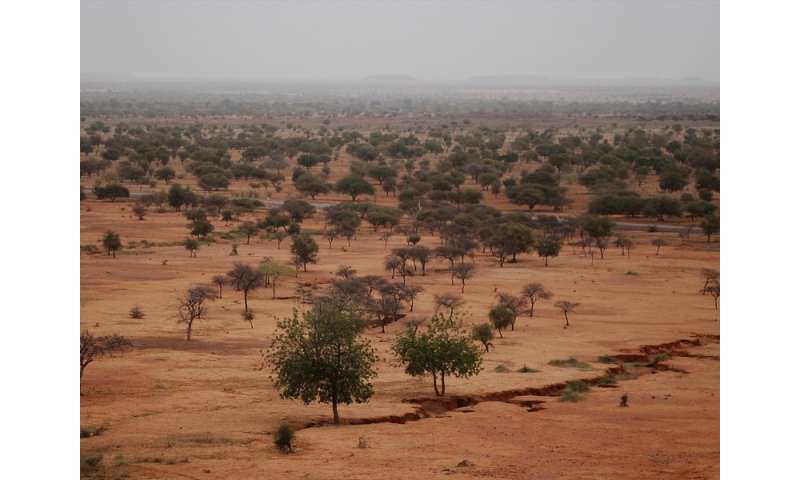 Moreover, according to the current study, the future development of precipitation in the Sahel region is crucially dependent on the warming of the Mediterranean. Practically no other region in the world has a climate as variable as the Sahel. The climate in the region, which is several hundred kilometres wide, located south of the Sahara, and extends from the Atlantic coast of Senegal to Eritrea on the Red Sea, is dominated by the West African monsoon. This brings rain to the entire region from June to September while drought prevails in winter. The actual cause of this weather phenomenon is the higher position of the sun during the summer months, as a result of which temperatures in these latitudes increase. This has different effects on the land and ocean, however, as water can absorb more heat. "So the land heats up more in summer than the ocean," says Jürgen Bader, explaining the principle of the monsoon. "Air rises above the warm continent and moisture flows in from the sea as a result." The intensity of the monsoon has varied repeatedly over time. Following a relatively wet period in the 1950s and 1960s, the Sahel experienced several periods of severe drought up to the mid-1980s, which claimed over 100,000 lives. Surprisingly, the rainfall increased again after that. Jong-yeon Park, Jürgen Bader and Daniela Matei from the Max Planck Institute for Meteorology in Hamburg have now discovered the main cause of this. "We show that the warming of the Mediterranean – which is due to anthropogenic climate change in part – is the most important factor at work here," says Daniela Matei. The Mediterranean should therefore also play a crucial role in whether it rains more or less in the Sahel in future. The intensity of the monsoon in the Sahel generally depends on variations in the warming of the different marine regions. Climate researchers explain the drought of the 1970s and 1980s by the fact that the temperatures in the Atlantic and Indian and Pacific Oceans changed according to a particular pattern. These changes resulted in lower precipitation in the Sahel region. And different temperatures in different marine regions also explain why there has been more rain again in the Sahel since the 1990s. "The different marine regions 'fight it out', so to speak," explains Jürgen Bader. "If the temperatures of the tropical sea surfaces rise, the precipitation in the Sahel falls. As opposed to this, rising sea surface temperatures outside the tropics result in more rainfall in the Sahel." As Jong-yeon Park and his supervisors, Daniela Matei and Jürgen Bader, discovered through model calculations carried out for his doctoral thesis, the West African monsoon was more intensive in the past 20 years than in the two preceding decades because the water in the Mediterranean was warmer than that in the tropical marine regions. Thus, the difference in temperature between these marine regions will be a crucial factor in future rainfall development in the Sahel. Jong-yeon Park used the latest version of the Max Planck Earth System Model MPI-ESM for the calculations. He worked through various scenarios using different simulations. An interesting effect emerged from this process: "If you keep the sea surface temperatures in the Mediterranean constant, the rainfall in the Sahel does not increase," he reports. In contrast, in other model experiments in which the Mediterranean heated up but the Arctic, North Atlantic and North Pacific Oceans did not, more rain fell in the Sahel region. The researchers can also explain the effect: if the water temperatures in the Mediterranean increase, humidity also increases. It would appear that this increased moisture from the Mediterranean acts as a kind of spark for igniting the West African monsoon: in June it flows over Egypt in the direction of the Sahel. "So there is more precipitation at the beginning of the rainy season," explains Jürgen Bader. The additional moisture strengthens the convection over the Sahel region. "More air rises which, in turn, intensifies the flow of humid air from the tropical Atlantic," he adds. Even if the scientists have now identified the temperature as the decisive factor for the development of the monsoon in the Sahel, whether or not the positive rainfall trend will continue in the future is dependent on the Mediterranean warming up at a higher rate than the tropical oceans. As the Hamburg-based researchers note in their article, more detailed research on the expected development of sea temperatures is needed to forecast this. And this is precisely what they plan to do in further studies. West Africa used to be a garden -- until the climate changed. Now the climate changes again. After all, change is the essential process of all existence. The disruptions will cost lives as the water sources dry up, those glaciers which provide water to a billion people. Some people do not care. It has been fluctuating for most of mankind's existence, and I wonder if this has anything to do with large numbers of people that live the Sahel being nomadic? When it dries up in one area it is time to move to one not so dry, this would certainly hastened trade as well. I am sure that the Sahel taught humans and their ancestors plenty on their way to Now. When it's dry it is man-made. When it's wet it is man-made. Perhaps they could tell use what part man-made CO2 played during the 1920s and 1930s? Just more fodder for the ignorant, hungry Chicken Littles....eat up. Interesting. Mother Earth is fighting back against the slash-and-burn and unsustainable farming methods that have laid waste to most of the region, as historically the Sahara Desert has been steadily expanding southward due to the uncontrolled exploitation of what arable land there was at its perimeter. 100,000 deaths from any source is a tragedy; but the population of Central Africa, including the Sahel, has quadrupled (at least) in the last 50 years. perhaps monkey goracle is really as dumb as he looks ? The greening is more likely the result of the increased CO2 in the atmosphere. Global warming is just coincidental. "that which is stated without evidence can be dismissed without evidence"
How zen. Somehow I don't think Confucious would condone actively changing something and then advocating you should just accept that "things change". The drunkenness is more likely the result of the increased alcohol levels in the blood. The alcohol-related liver disease is just coincidental. The retardation is more likely the result of the empty space between the ears. The stupidity is just expected.